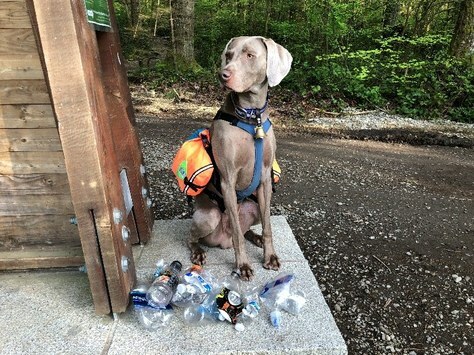 Meet Coulson, the perfectly trained Weimaraner who helps collect trail trash. Trail Tails is a special feature showcasing the mutts of The Mountaineers! This month we recognize Coulson, owned by Mountaineer Darcy Jayne. When did Coulson first hit the trail? Nine weeks old. Yes, that's very early. Starting early was encouraged by his breeder and I was careful with time, distance, and terrain. He's four years old now, and preparing to tear up the course in agility. What’s your favorite outdoors memory with Coulson? All the people who've met him and commented on his awesome trail manners. He's a great ambassador for dogs hiking with their humans. What’s a fear your pup has overcome, or a trail skill they’ve developed? In addition to his fondness for fetching trash, he's thoughtful and determined when it comes to navigating trail obstacles. He knows to allow extra space for his pack, and on the rare occasions when he gets stuck or misses a step, he thinks his way out of trouble. He's even managed to scale the greeter boulder at the start of the Rattlesnake Ledge trail. What’s Coulson’s favorite thing to bring on outdoor adventures? Going on a hike is one of his favorite activities. What’s Coulson’s go-to trail snack? Tucker's Carnibars and whatever I have that I'm willing to share. Coulson started watching me pick up litter, and with a little work with commands he easily became a happy litter retriever. When he’s off-leash, he knows to return to heel whenever other hikers approach. He points to wildlife for me, but doesn’t chase it. Remember, it's key to keep trail etiquette and leash laws in mind when you hit the trail with your animal. Always check to be sure that the area you are entering is dog-friendly, and pack more dog bags than you think you need. Check out our guide on hiking with dogs, and remember to use the WTA's handy 'dogs allowed' filter on their Hiking Guide.